I had promised a comprehensive post about the unraveling of Husain Haqqani when it first happened. The different aspects of the case (technical, political, legal) that led to his resignation as Pakistan's ambassador to the United States - now commonly and irritatingly dubbed 'Memogate' - however, not only required a lot more time to deal with than I then had available, but has already been commented upon in bits and pieces by various analysts all over in newspapers, on television and on the net. Far more importantly, it now seems like a footnote in the rush of current events. 1. 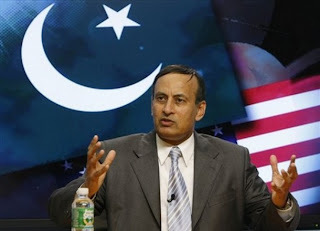 The military establishment was never pleased with the appointment of Haqqani as Pakistan's ambassador to the US and had been gunning for his head right from the beginning. Whether this was because it actually believed Haqqani was not sincere to Pakistan's interests, whether it felt it needed someone more on its institutional side in the US, or whether it was simple vindictiveness that arose out of Haqqani's well-regarded 2005 book "Pakistan: Between Mosque and Military" which critiqued the military's role in fostering religious extremism, I do not know. What I do know, however, is that it tried many times covertly to vilify Haqqani through the media in order to have him pushed out, the most recent previous example being over the Raymond Davis affair. 2. It is my educated guess, based on the evidence available so far, that the military did not precipitate the memo crisis, but it certainly pounced on it with great glee once the existence of the memo had been revealed by Mansoor Ijaz's oped in the Financial Times. 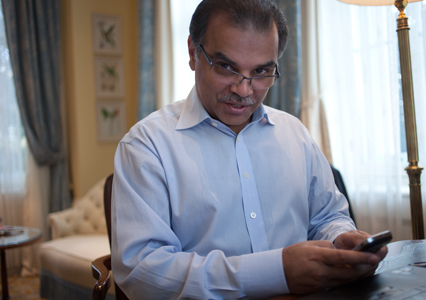 It is also my strong hunch that the only reason Mansoor Ijaz did what he did was initially a banal hunger for the limelight, a desire to be seen as a 'player' in international politics. He has always harboured great ambitions to be seen as such, as well as deep-rooted resentment that his alleged earlier forays into Sudan and Kashmir had not provided him the importance he felt he deserved. Before his FT piece, no one knew even of the existence of the memo or perceived any notable shift in US policy because of it. His subsequent posturing was precipitated by a sense that he was once again being belittled and mocked. 3. It is my considered belief that Husain Haqqani was, in fact, involved in this saga, based on the 'evidence' presented so far in the public domain and my own knowledge of Haqqani's personality. You are free to disagree with this, it is after all only my opinion. Haqqani has always been an extremely intelligent and clever man (some colleagues have often dubbed him Machiavellian in his brilliance) but in this case he probably overreached and did not anticipate the power of the desire for fame that underpinned Mansoor Ijaz's personality. Haqqani also did not anticipate that his attempts to discredit Ijaz through certain blogs and newspaper articles - not under his own name of course, but I choose to leave them unnamed - only angered Ijaz further and made him more resolute in exposing all. It helped of course that Ijaz had the military to goad him on. For one of the most brilliant media tacticians, this was Haqqani's fatal miscalculation. There still remain plenty of unanswered questions about why Haqqani did what he did, especially because public opinion after the May 2 Abbottabad raid, if one cares to remember, was decidedly anti-military and certainly not conducive to the kind of coup the memo was allegedly in response to. My own feeling is Haqqani (and possibly President Asif Zardari) felt it to be an opportune time to bring the khakis to heel and he chose to go via the Mansoor Ijaz route (despite his dubious credentials) precisely because it provided the requisite plausible deniability. I can present no definitive evidence to back up these gut feelings, which brings me to the next point. 4. I don't believe that, legally speaking, Haqqani can be linked directly with the memo based on the evidence presented so far. At best, even if (and that is a big 'IF') RIM - the company that runs Blackberry services around the world - provides concrete evidence of the authenticity of the BBM messages exchanged between Haqqani and Ijaz, there would still be only circumstantial / speculative evidence that what they actually discussed was the memo itself. The most recent revelations by WikiLeaks - which indicate that "software products could not only read emails and text messages sent from spied-on phones, but could actually fake new ones or alter the text of messages sent" can be used by Haqqani to cast even more doubt on the alleged BBM exchange. There is not even that little level of evidence to link Zardari to the memo. Keep in mind I am speaking purely from a legal point of view, which is the only point of view that matters as far as the courts are concerned. The Supreme Court inquiry into 'Memogate' is bound to run into a legal dead end, like it or not. 5. I don't subscribe to the line of reasoning of those who rose to the defence of Husain Haqqani by saying that 'there is nothing wrong in the memo even if he did write it'. They misjudge how it plays in the minds of even the most pro-democracy of Pakistanis and certainly misjudge its impact on public consciousness. No one in their right mind thinks the solution to the Pakistan military's obtrusiveness in domestic politics lies with the US. Not even Haqqani has claimed that; in fact he has used that argument explicitly to denounce linking him with the memo. So where does this all leave us? Some people will be angered by this analysis. No doubt Mr Haqqani and his die-hard supporters will question my assumptions even though I have attempted to clearly label them as my opinion where appropriate. On the other hand, his detractors will consider this a cop-out: if I really do believe he was involved, they will argue, how can I be satisfied with no repercussions? Simply because my 'gut feelings' are no substitute for solid proof. All I am trying to lay out is how I think matters played out and will play out from a legal point of view. But it's not that there have been no repercussions already. Husain Haqqani's career as a Pakistani envoy is finished at least pending some sort of major revolution in Pakistan (and I don't mean of the Imran Khan variety). He has resigned and that will be that from a legal point of view in my opinion. But far more is going on behind the surface that requires a closer look. The reason I say that the memo saga is fast becoming a footnote in the rush of current events is because of political developments of which it now seems one small part. The latest of these is the speculation over Zardari's sudden departure for the UAE ostensibly for "medical reasons" and the media frenzy about whether it signals his imminent resignation. No logical scenario entails any such resignation by Zardari (neither legally nor politically) but the media (with some notable exceptions) is not often one troubled by looking at things logically. However, what the hysteria around it and around the memo story indicates is not just wish fulfillment on the part of media anchors. It indicates that there is a concerted effort in place to tip things into at least a perception of crisis. Two independent sources, both extremely well connected, have been talking big in private gatherings recently. One of them is a prominent businessman with links to military intelligence operatives. The other is a close family member of a recently retired high-ranking military man. Both say the same thing: that the entire political 'set-up' will be 'wrapped up' in January. While the sources for their 'information' are patently military, they both cited cases being heard in the Supreme Court, which are at critical stages, as the catalyst. The three most important cases referred to are the one against the National Reconciliation Ordinance (which has finally been decided against the government), against the Rental Power Agreements (in which government is accused of corruption) and finally the one calling for an inquiry into the secret memo and the government's role in it. The decision on these three cases in particular will supposedly tip the situation from one of impending crisis into a real one. So far nothing spectacular other than an apparently definitive timeline. Many analysts with no inside knowledge could make similar predictions. However, what these sources say next is notable. They both claim that what would follow the 'wrapping up' of the current political dispensation are not elections but an interim arrangement along the Bangladesh model, and the name they mention is reference to who might head up such an arrangement? Former 'clean' minister and businessman Jehangir Tareen. MNA Jehangir Tareen: Mr Clean Sweep? When I first heard this, I did a double take. Wait, I asked, didn't Tareen already announce he would join Imran Khan's Pakistan Tehrik-e-Insaf (PTI)? No, I was told, he quietly took back his decision when he was 'asked to reconsider.' Indeed, Tareen has not yet joined PTI though PTI sources claim 'negotiations' are continuing. Now, Tareen's name could well be red herring. When I first heard this, as I said about two and a half weeks ago, it immediately made me question whether the military establishment's obvious sympathies for Imran Khan were wavering. But there are already reports that the delay in Tareen joining up with Imran Khan has more to do with internal dissent within his group, some of whom want a more prominent role vis a vis PTI. If Tareen does join PTI as expected by the time of PTI's rally in Karachi on December 25, we can put at least this particular claim to bed and allay all doubts about where the brass' sympathies lie. Hint: Not with Nawaz Sharif (and he knows it). But there are other major issues with these claims as well (even without Tareen in the mix) which stretch my credulity. Primarily that it would take a lot of shameless somersaults for the Supreme Court to validate yet another diversion from the constitution. And despite the fact that stranger things have happened in this country, such a scenario seems very unlikely to me at this point. There is no doubt in my mind, however, that a very serious game is nevertheless afoot. So there you have it. If nothing of the sort happens, and the PPP government actually addles through the next couple of months, I promise never to indulge in such rumour-mongering ever again. But if something significant does occur by the end of January, I would have hated to have been in a position of saying 'Guess what I'd heard in November!'. Incredulous to say the least. The part about Haqqani - you forget the prosecution can claim/produce telephone records of Zardari calling Haqqani - but of course that would be dismissed under pre-text that the President under special circumstances needed to be in touch with his man in Washington - details cannot be disclosed in national interest. the one point you do not address is why would haqqani settle on using Mansoor Ijaz (not even going to stir up the pot of whether HH knew of OBL raid in advance). There MUST have been other options - some more loyal. HH may possibly have drafted the memo but to choose MI to deliver?? Some one as seasoned, and knowing consequences of memo being found out, would know at least not to go with someone having a penchant for being a fame hungry whistleblower!! You make one mistake, two, not a whole damn catalogue!!!! To the "rumour" mongering part - O am surprised how you missed out the Abbottabad raid commission result - which is due out at the end of December. If anything that is the potentially most damning of all for the military also the Salala attack report. If the govt is expected to be at its weakest point at the end of december - so is the establishment!! Here is a prediction for you - Red December 25!! Have been hearing about an impending change too, both from army and diplomatic sources, but there are usually many slips between the proverbial cup and the lip. If the civvies in power cut extra slack they might be allowed to carry on. Spot on about HH. My 'opinion' is that since he has more contacts amongst the conservative politicians/think tanks, he probably thought he should go the army route. Bad idea. Talking to MI, bad bad idea. Not giving him the full money, apparently promised to him, even more bad idea. Joining PTI after SMQ, wouldn't beTareen's first choice - since including IK, there will now be 3 PM hopefuls - even if Aabpara really obliges. Shaayad Pakistan mein sahafi kam aur chidiyaan zyada hain. Bangladesh model = state of emergency + caretaker government? Can anyone explain what the Bangladesh model means? I have confidence in HH's media savvy skills to get out of this alive and kicking. After all he let his pants down in front of clicking cameras to show that he was being tortured at a "safe house" in Islamabad in 1999. He knows what to expose and when to expose it! Remember, he was a Jamiat President of the Karachi University Student Union, a close aide of Nawaz Sharif and a Minister in Benazir's government - chameleon's just blend into their surroundings. As far as Jehangir Tareen is concerned, he is an Aithchisonian - doesn't that say it all! - a dynamic no-nonsense person who, when he was Minister of Industries and Production, turned around the engineering sector by creating an Engineering Development Board and sending dozens of engineering goods manufacturers to exhibit their products at trade shows in Europe. He came up with the fascinating fact that while we focus on textile exports, textiles are a very small fraction of world trade. Engineering goods account for a major share of world trade and unless we make inroads in this sector, we will not be able to grow our exports. December 25 is just two weeks away - let us see which new star will light up the firmament for us who remain at the mercy of KESC and WAPDA. Very Scary but Very Probable too. The Khakis are suffering from itchy fingers once again. And the Awaam is willing to suffer amnesia all over again. I would only like to comment on your legal note that involved Wikileaks revelations. IF we are to reference Wikileaks revelations in legal matters, that automatically means that we are endorsing and accepting all the other revelations made by Wikileaks from time to time, including the ones related to our PMs, Presidents, Generals and all politicians on their dirty doings. That in turn will open a Pandora's Box IMO. Mind that point before you actually use this sensitive reference, Mr. Haqqani! And another thing that I have been trying to figure out, why is HH planning to sue everybody except FT, the ones who started the battle on behalf of MI... Why no legal action against the FT? This is a brilliant piece bit of analysis. Cafe Pyala has nailed the matter. As for the churlish Anynoymous exposition, one refers Anynoymous to the actual BBM transcript. It is a fascinating read that shed lights on the motivations and objectives of the shifty protagonists. So is this the reason why PM Gillani has been constantly announcing some kind of "Martyrous Suicide"? and rest of PPP is in a state of verbal, practical and literal limbo? The PML-N has filed a case in the already over-burdened Supreme Court (SC) that inviting US interference is tantamount to treason. Was it not interference when Shahbaz Sharif sought US help to restrain General Musharraf when it was written on the wall that he was going to oust an elected government? Was it not US interference when the Kargil adventure of General Musharraf brought defeat to the country and Prime Minister Nawaz Sharif rushed to seek US intervention on July 4? So, ideally, yes we should not be inviting the US as done in the memo and offer cooperation but the reality is that we have a long history of US involvement in Pakistan’s internal affairs and nobody ever raised the issue that it was treason. Here comes the duplicity of democratic powers and hard luck of PPP that its leaders are ever targeted by right wing elements. PPP always found it in catch 22 position because it is soft target for radical seeds. Well written. Though I am not a big fan of HH/PPP but it is good to see an unbiased anlaysis. Can't wait for your next post! Haqqani's nuts are in a vice and he has those incriminating BBMs to thank for it. Nobody did anything to him, or his party. They did it to themselves. Unlike Midas, everything the PPP touches lately, turns to crap. What was supposed to be a bomb for Pakistan (it's nuclear assets, it's armed forces, it's sovereignty), blew up in the face of the bomb-maker himself, at home. This party just can't catch a break! Once authenticated, the electronic signature of those BBMs,as well as email messages are permissible and have been used extensively in criminal court proceedings in US courts. The state of affairs wrt Pakistani penal code, after passing of the recent Cyber Crimes Bill, is up in the air I guess. Pyala was excessively deferential to the pro-Haqqani crowd in this post. It is understandable, since they are close personal friends. It must have been hard to give them even a tepid shock to the system. Therefore, I applaud this effort. Bravo! Once you have read the BBM exchange and perused the 80+ pages of notes and material submitted by Mansoor Ijaz... HH, his "boss" Asif Zardari and the couple of retired Army generals who helped draft the memo... there is no doubt left of the gravity of the crime and what must follow next; the punishments are laid out clearly in Article 6. Except, of course, for those who have taken the blood oath of blind following to everything and anything, PPP. If PPP Govt had balls, they would strap a suicide vest and hurl themselves at the Chief Justice of the SC to save their party Co-Chairperson like any respectable terrorist, rather than calling him names and throwing temper tantrums on TV. Your explosive lead seems to be heading in the general direction that you suggested judging by today's lead story on the Dawn website. I am dumbfounded really. I thought with IK in the fray, there was finally going to be some much competition and something good was finally going to happen.